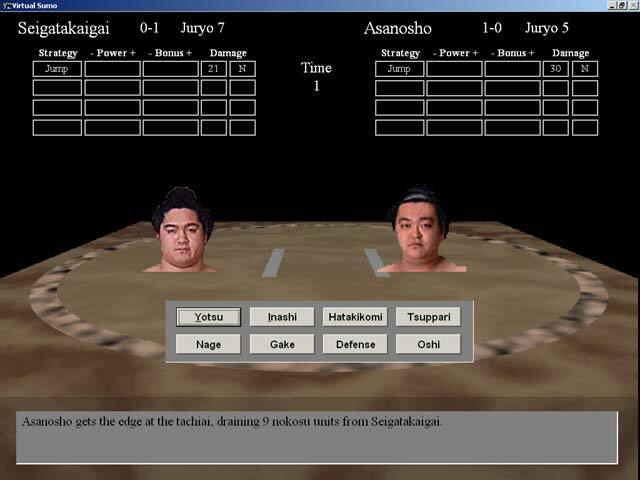 Virtual Sumo is a computer game I spent a lot of time developing over the course of two years while living in Japan. Since moving back to the U.S. in late summer 2000 and getting a Real Job™ I haven't gotten around to working on it. I am now planning to get back into it as time (and wife/2 kids/full-time job/too many hobbies) allows. I've learned much and developed many skills (Photoshop, Flash, design, Object Oriented Programming, etc.) 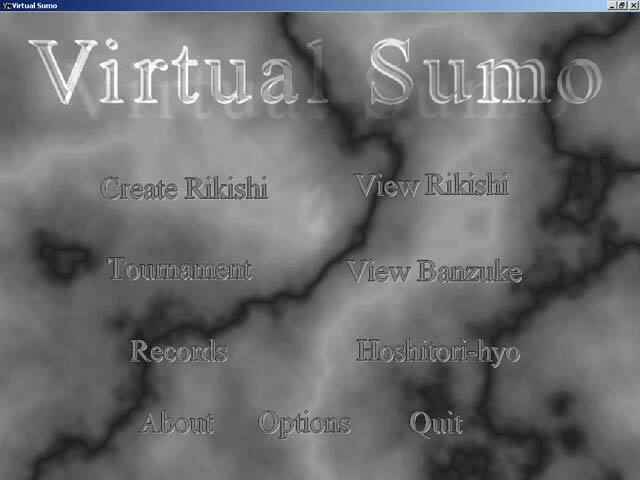 in my job as a web developer that I hope to apply to future versions of Virtual Sumo. First off I plan to develop a Flash version and see where that goes. Being in the web development field, I'm also interested in a web-based game, possibly multi-player...but, one thing at a time. The last version I released--shortly before we left Japan. 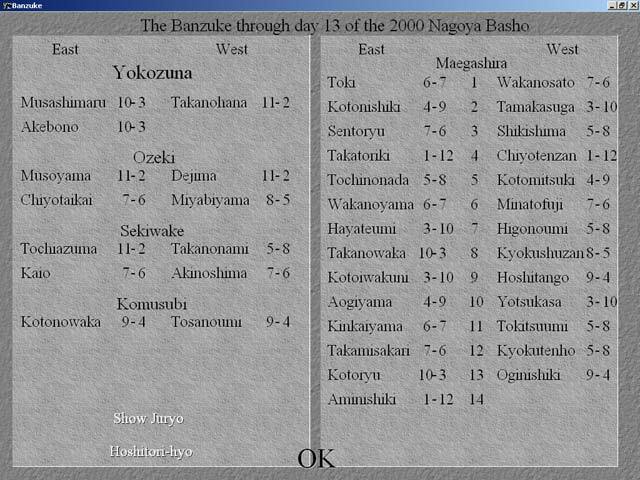 Included a major re-write of much of the code and an improved sanyaku promotion scheme. Juryo division, retirement, rikishi generator, improved dynamic torikumi scheduler, improved banzuke sorting algorithm. 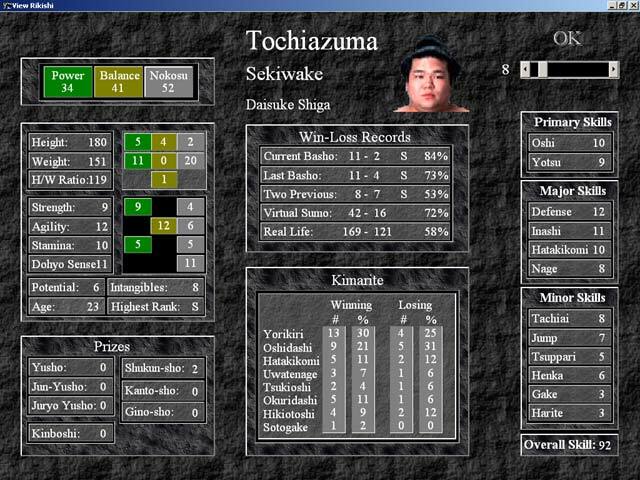 Rikishi portraits represent matches graphically, rikishi portraits displayed along with statistics, hoshitori-hyo, records page. 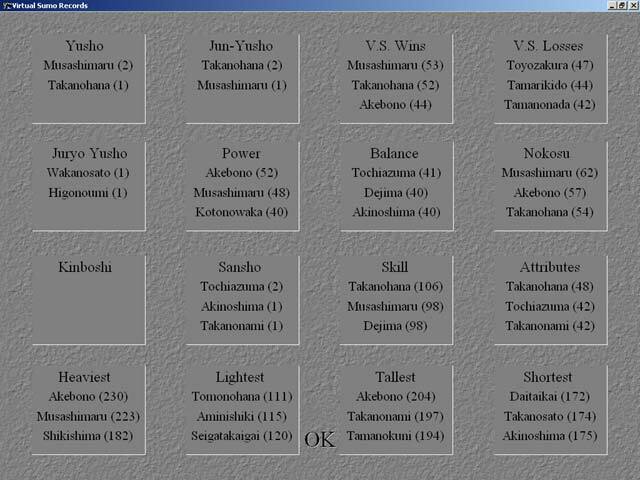 Kimarite, improved graphical interface, basho names/places displayed. Skills system, attributes, balance and nokosu bars, kinboshi, sansho prizes, HTML manual. 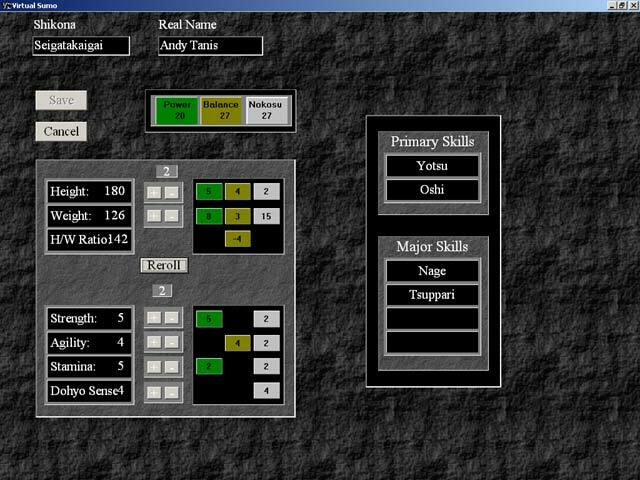 Converted to Windows9x, gaming/strategy matrix, improved opponent AI. Mono-ii, tournament leaderboard, improved kettei-sen. Dynamic cyber-rikishi, potential and age stats, dynamic sekiwake and komusubi ranks.